It was inevitable. I’m tired of eating. … of eating out, anyway. And since I’m in a foreign land where ingredients that I could only dream about are readily available, I decide I should get cooking. 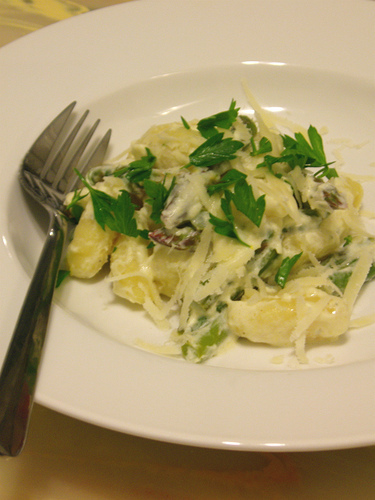 Gnocchi is one of those mystical ingredients that I have only tasted in restaurants and have longed to cook. Admittedly, you can make it at home. But honestly, I have a phobia of things that involve flour, kneading or any kind of baking procedure. I don’t make my own pasta. I don’t cookies or pies. I don’t bake. Obviously, I don’t make my own gnocchi. Since I’m in a country famous for its need for immediate gratification–frozen this, instant that–cooking gnocchi is a breeze. Besides using prepared gnocchi, the editors at Olive Magazine makes this recipe even simpler (intensely more flavorful) by using a herbed cream cheese as a sauce base. Bring two pans of salted water to the boil. Cut the asparagus into three cm lengths, keeping the tips separate. Put the cut asparagus into the boiling water and cook for two minutes. Remove and drain thoroughly. Cook the gnocchi in the other pan in the boiling water. Once the gnocchi floats to the surface, drain it. Place the cream cheese in a pan with eight tablespoons of water and the lemon zest. Stir together over medium heat until cream cheese melts in a creamy sauce. Season with salt and pepper. Combine sauce with gnocchi and asparagus. Plate and scatter the parmesan and parsley over the dish. Thank you to W, the perfect host and a most appreciative dinner guest. It does get tiring to eat out daily when you travel. I've been out on the road for four weeks and luckily have had time to cook at friends' homes. It's my small way to give back to them for giving me a home away from home and is a great way to think creatively. Hi Mila. I absolutely agree with you. And besides, I like the idea of working with ingredients that I wouldn't normally work with in Manila.